It’s been a month since we said goodbye to Joanne Thomas and it still hasn’t sunk in that she is gone. Any moment now I half expect to see her poke her head into my office reminding me that: “It’s time for el luncho,” chiding me for making her and the rest of the staff wait, because “We’re starving back there!” But I knew then as I know now that hunger wasn’t the only reason Joanne pressed me and others to join her at lunchtime. Having lunch together with the staff was a priority for Joanne. It was her way of staying in touch with all of us who worked at Options, including client services staff, administrators and volunteers. The small talk and the client services updates were as important to her as any business meeting or executive task. Even though Joanne was the executive director she always made an effort to keep herself informed about client contact as much as possible considering the varied responsibilities that claimed her attention. I’m not just talking about data and statistics either. She loved to hear about the challenges our clients faced and always guided us toward a compassionate response. She encouraged our client services team while at the same time urging us to reflect on what we could have done better or how we could in the future reach more women in the same situation. Resting on statistical successes didn’t seem to excite her as much as promoting Options compassionate presence in a community where abortion is so readily available. She wanted to expand our message to an ever widening audience and would often brainstorm with us around the table on how we could reach more women in need of our services. Joanne felt that communicating around the lunch “conference” table helped her and us to stay grounded as a ministry. Joanne also strongly believed that sharing lunch and sharing ideas cultivated unity among our team. “I never want us to feel split,” she used to say, which in retrospect was a keen insight into how communication was vital to us in cohering as a group comprised of diverse individuals involved in all different arms of the ministry. Lunch was an event that was marked in our daily appointment book, and no matter how busy we were, we met at the back table each afternoon for rest, refreshment and reflection, and as in any real family, sometimes for a spirited discussion, for sudden outbursts of laughter or tears, or for spontaneous prayer for our clients and each other. The lunch table was also where Joanne shared and received updates about the most recent episodes of the popular TV series “This Is Us.” She really loved that show. I can’t hear anyone mention “This is Us” without smiling and thinking of Joanne. Nowhere is Joanne’s loss felt so deeply as when we gather in the staff room for our midday meal. Now, with Joanne gone, we instinctively know that we need to be together around the lunch table near 1:00 PM. We head back there each afternoon as if Joanne is silently guiding us to keep close together in our active grief as we do our best to continue with the work that was her life’s work, being actively pro life by being pro woman and building bridges to life through relationships. Joanne regarded a pregnant woman and her unborn baby as a union. As executive director, she would often speak publicly about the complexities of being pro life and cautioned against impulses that would have us of be hyper focused on saving a baby without first being focused on caring for the woman who carried the baby. Just as she understood the important union between a mother and her baby, Joanne strove for unity within the ministry. She welcomed participation from people of all different denominations and life experiences, but made sure we were united on key principles of treating all women with dignity and respect, helping our clients to feel that they were worthy of our compassion and support, and never judging women who rejected our services but always welcoming them back. She had great faith in the Lord’s provision in everything, especially in the way He provided for Options. Right now Options faces the difficult question of what will we do without Joanne? What does the future of the ministry hold without her leadership? As with any solid leader, Joanne trained her lieutenants well. We are carrying on just as she would want us to. Her legacy continues in the day to day service of Options. As Joanne was fond of saying, “Options is God’s ministry. We are all just holding a place for the next person.” Although none of us wanted to see Joanne’s place vacated so soon, we know in our hearts that her prophecy is true – not just for her but for everyone who serves. On my desk is a memo I wrote to myself before I left for my vacation in August. 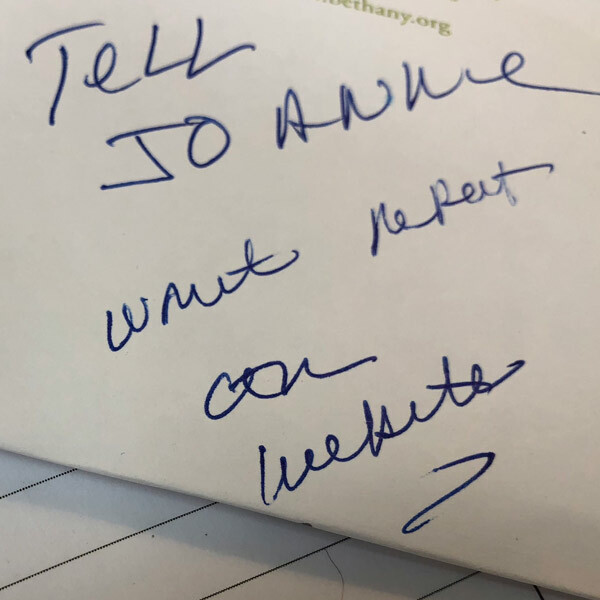 “Tell Joanne…” it reads. When I wrote that note, I never dreamt that I wouldn’t see Joanne again. I keep the note attached to my calendar as a reminder of Joanne. What would I tell her now if I had the chance? I would tell her that the Lord is providing. I would tell her that we never had so many surprise visits from moms with their babies than during the week that followed her funeral. I would tell her that we are all looking out for each other, working together, bearing each other’s burdens. I would tell her “Thank you,” for taking a chance on us and for assembling such a dedicated and diverse team. I would tell her that we love her and that we miss her. 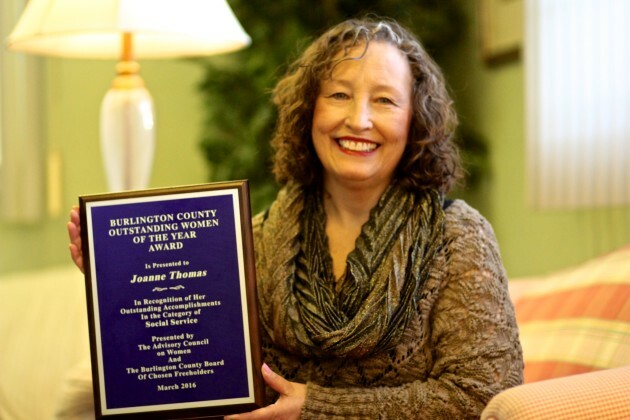 Joanne was awarded the Burlington County Outstanding Woman of the Year Award in 2016.